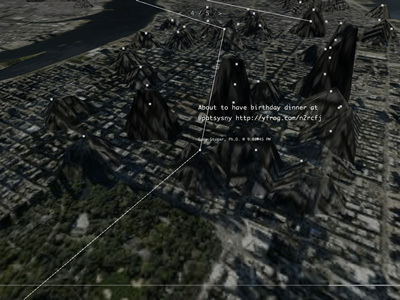 Invisible Cities maps information from one realm - online social networks - to another: an immersive, three dimensional space. 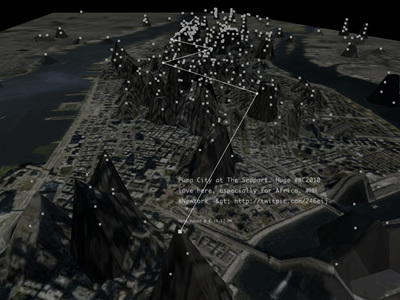 It displays geocoded activity from online services such as Twitter and Flickr, both in real-time and in aggregate. Real-time activity is represented as individual nodes that appear whenever a message or image is posted. Aggregate activity is reflected in the underlying terrain: over time, the landscape warps as data is accrued, creating hills and valleys representing areas with high and low densities of data. The interplay between the aggregate and the real-time recreates the kind of dynamics present within the physical world, where the city is both a vessel for and a product of human activity. Nodes are connected by narrative threads, based on themes emerging from the overlaid information. These pathways create dense meta-networks of meaning, blanketing the terrain and connecting disparate areas of the city.